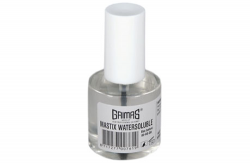 Grimas Water Soluble Mastix is a skin glue that can be removed with water. It is used for gluing wool crepe beards, moustaches and eyebrows or similar for children or in a classroom situation. Water-soluble Mastix is available in a 10 ml bottle with an applicator brush. Work preferably work on a dry base. First degrease and clean the skin you are going to be working on with cleansing lotion. Then dry the skin with a tissue. With aid of the applicator brush you spread Water Soluble Mastix over the skin area where something is to be glued on. 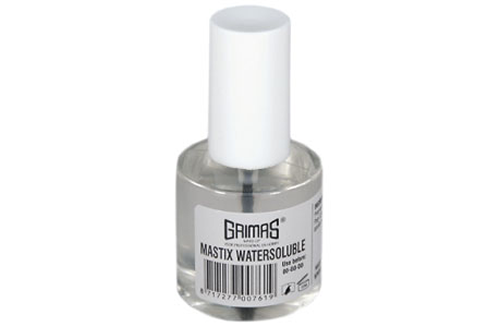 If you have worked with Grimas Mastix Water Soluble, you can remove with lukewarm water and a little soap if necessary. You can cleanse the skin with water and soap (shampoo can also be used). Massage it in briefly and rinse off with lukewarm water.Scrubbing too much with water and soap or shampoo can irritate the skin. You can clean the skin further if required with a cleansing milk or cleansing cream. 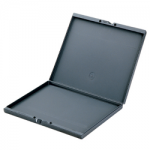 Massage it in gently and remove it with a soft tissue. Do not use ready-to-use cleansing cloths. Cleanse the skin further with Cleansing Lotion if necessary. If the skin feels dry after cleaning, you can apply a care cream. Packaging: 10 ml glass bottle with white cap and brush (polystyrene) 80 ml plastic bottle with white cap and brush (polyethylene) childproof cap. 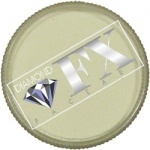 Toxicology: See safety declaration; assessed against the Cosmetics Regulation 1223/2009/EC. Contains Ethanol, known to be toxic and harmful to the unborn baby.